A Map of the World : Where do you find community? Having just returned from the Louisiana Book Festival in Baton Rouge, home of Community Coffee, I thought this would be an appropriate time to write about community, and how you find it. I’ve come to appreciate the literary community I have in Alabama, what I imagine as a safety net of connections all across the state. We meet at the symposium in Monroeville, the book festival in Montgomery, a book signing here, a performance there. Sometimes we meet at a funeral for one of us. I don’t see these people every day or even every month, but I know they’re there, and not just through electronic media. I know because a book that someone thought I’d enjoy shows up out of the blue, or the invitation arrives to write something, or the phone call comes to catch up and share each other’s news. I’ve sought out community at times, joining a church or group or cause based on a need to feel more a part of my area, less isolated. I appreciate these chosen communities as well, although the ones that have occurred organically sometimes turn out to be a better fit. For several years I was part of a summer program that took University of Alabama students to Ireland, and there I learned about and began to attend the Yeats International Summer School in Sligo, Ireland. I’ve been there five times now, and made friends with others who attend, and even had a hand in bringing Irish poet and anthologist Joan McBreen to Alabama for readings. I knew when I started going to the Yeats School that I was looking for a connection to poetry outside of the U.S., beyond AWP and the MFA scene, but I had no guarantee that it would lead to these friendships and to the enrichment of my own writing. Ireland, roughly the same size and population as Alabama, is a home away from home for me now. For various reasons, I skipped the Yeats School this past summer and found myself immensely homesick for it. When I was invited to submit something—a poem, story, or essay—to the collection that became known as The Shoe Burnin’: Stories of Southern Soul, I was initially trepidatious. I was going to go out in the country and burn shoes and spill my guts? This did not sound like me. But I am committed to trying new things even if they don’t always work out. I decided to go. I could always leave early. Turns out it wasn’t so much about the collection as the group of people that gathered around to create it: musicians and writers and organizers and editors first, publishers and designers and promoters and readers and festival-goers next. What happens when everyone decides to make something happen no matter what? A group commitment developed, an ethos of generosity and mutual respect—in a word, a community. I found myself grateful to be a part of it, enriched by the new people I was meeting, challenged to do more than I’d thought I could. As a writer I’m often a loner—and I need to be to get to that deep place that writing comes from—but the places I belong remind me that we all need to be connected, whether you find community or it finds you. 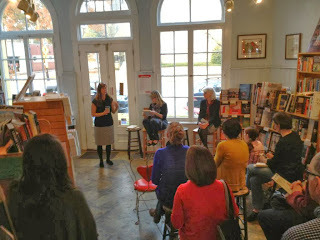 Photo: Wendy Reed, Susan Cushman, and Barbara Brown Taylor discuss "Circling Faith: Southern Women on Spirituality" at Avid bookstore in Athens, Georgia.